Centrally located in the so-called "Wall Street of the Philippines", New World Makati Hotel is a luxury oasis in the heart of Manila. With club rooms, restaurants, lounges, meeting spaces and even a ballroom, New World Makati Hotel is ideal not just for a perfect night's sleep, but for any event you can imagine. All guest rooms are equipped with a marble bathroom, work desk and fast, complimentary internet. Check-in occurs in an enormous entrance hall filled with light and space. Our check-in went very smoothly and we were swiftly led up to our room. New World Makati Hotel offers three categories of room: Superior Room, Deluxe Room and Premier Room. We had a deluxe room with access to the Residence Club (more on that in a moment). Our deluxe room had a beautiful king sized bed that was extremely comfy, a fantastic shower, and quite possibly the best bath we've ever had: it was incredibly comfy. We also had a large desk and something we think every hotel should have: a plug that can be used regardless of what kind of plug yours is (i.e. British, American, European etc)! The Residence Club is located on the 24th floor and features the Residence Club Library and the Living Room. The Residence Club Library is great for anyone who hasn't brought a laptop with them and anyone who needs to use the printer. With flight tickets to print, we fell in the latter category, it was a real asset not to have to worry about where we'd find a printer. The Living Room was probably our absolute favourite place in New World Makati Hotel. Here, coffee, tea and refreshments are available throughout the day. Combine this with the comfy chairs and it really does feel like the perfect living room, add in the amazing views and it's incredible. Snacks and drinks are served between 5.30pm and 7.30pm. Snacks consisted of amazing fresh French bread, delicious soups, fruits, cute little cakes, salads, and for non-vegans - cheese and sliced cold meats. The food was all delectable in the Living Room and the staff were simply incredible!! They were all so lovely and kind and really helped make the Living Room feel like home! They were just so friendly! On the second morning, we had French toast and it was the best we've ever had. I also tried a Filipino breakfast, which was jelly, tofu and a sweet liquid. It was quite interesting! New World Makati Hotel has a 25 metre long, outdoor swimming pool. We had a great afternoon here, lounging on the uber comfy sun deck, cooling off in the pool and enjoying the refreshing drinks at the Splash Pool Bar. The Communications Executive had afternoon coffee with us and then kindly took us on a tour of the hotel. The tour revealed to us just how well equipped the hotel is to host absolutely every kind of event imaginable. There are 1,800 square metres of multi-functional event venues, including a 675 square metre ballroom, numerous meeting rooms, a beautiful Glasshouse and Gallery - venues with their own residential style kitchen for meetings, conferences, weddings and other events. The hotel also has a 24-hour fitness centre, a spa and an on-site doctor. Unfortunately for us, Tanbay was super ill (traveller's diarrhoea) at this point in our trip, but fortunately New World Makati was the best place to be because of their on-site hotel doctor. Antibiotics have to be prescribed to you in the Philippines by a doctor (same as in the UK), and attempting to go to a clinic when you're ill would probably be a nightmare. During our stay the on-site doctor came up to our room and sorted Tanbay out, it was such a weight off our shoulders! Going to the doctors can be a pain at the best of times, but when you're abroad it can be an absolute nightmare. We were so grateful that we were staying at New World Makati. +63 2 811 6888 is New World Hotel Makati's Contact Number. 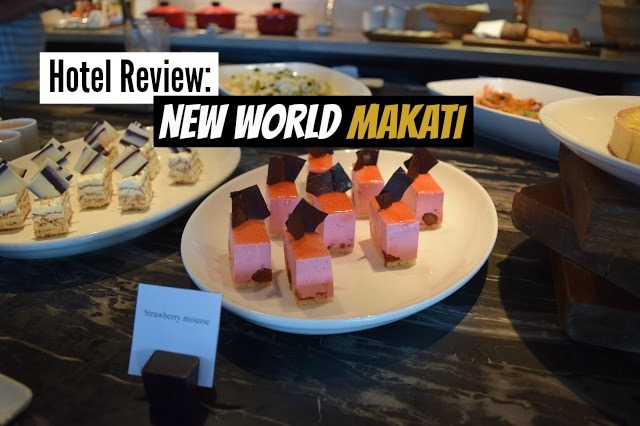 All in all, we really enjoyed our stay at New World Makati Hotel and highly recommend it. The location is ideal, and the lovely staff and awesome Living Room concept make for a perfect stay. Booking can be done on New World Makati Hotel's website: manila.newworldhotels.com or try Hotels.com or Agoda for the best rates. Disclaimer: Travelling Weasels were invited as guests of New World Makati Hotel, however, all opinions are our own as always.